Hi. 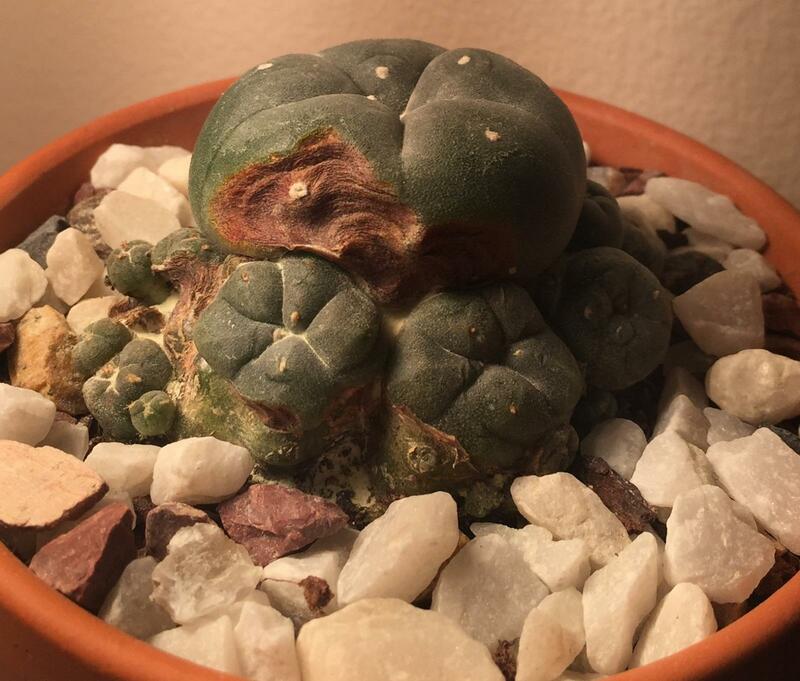 One of my peyotes has rot. Thing is, the rot isn’t soft it’s rock hard and woody. It’s spreading - slooowly - but is definitely calcified, also, the white tufts are still there, on the wooden rot part. Not sure how I attach pictures here (I’m using phone not a laptop). Sulphur powder didn’t stop the spread. My question I suppose is whether hard, wood like rot like this is common? It’s not mushy or soft at all. Sounds like callousing to me - as opposed to rot which is usually soft and mushy. Hi.I'm not too good with the internet. Here are photos taken today. First off.......EXCELLENT PHOTOS !!!!!! Thank you for taking the time to frame a clean, clear image. KUDOS !!! While not attractive, I can't say that I've seen this before. The plant still looks very healthy. You're a Free Member now. I'll move this out to Botanicals for more views and commentary. Hi. 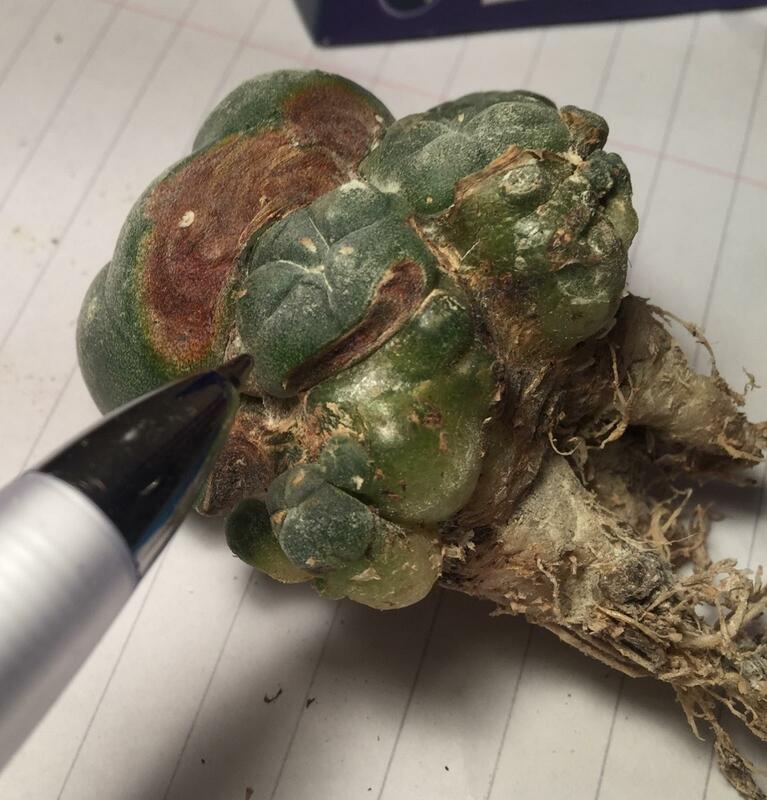 The plant appears healthy, but the 'rot' (sic) is ribbed, tough to the touch and hard. Like wood. The outer edge 1 -2 mm is softer (the more orange-brown rim around the 'callousing' but it hardens off. This is what it used to look like 8+ weeks ago, prior to the problems, so you can observe the spread. I have to say I have never seen this one. I noticed the orange band on the edge. I am presuming from your description, that as this orange band expands across the cactus, that it leaves a hard woody scar in its wake. It may not be progressing as quickly as orange soft rot, but you can't see whats underneath. 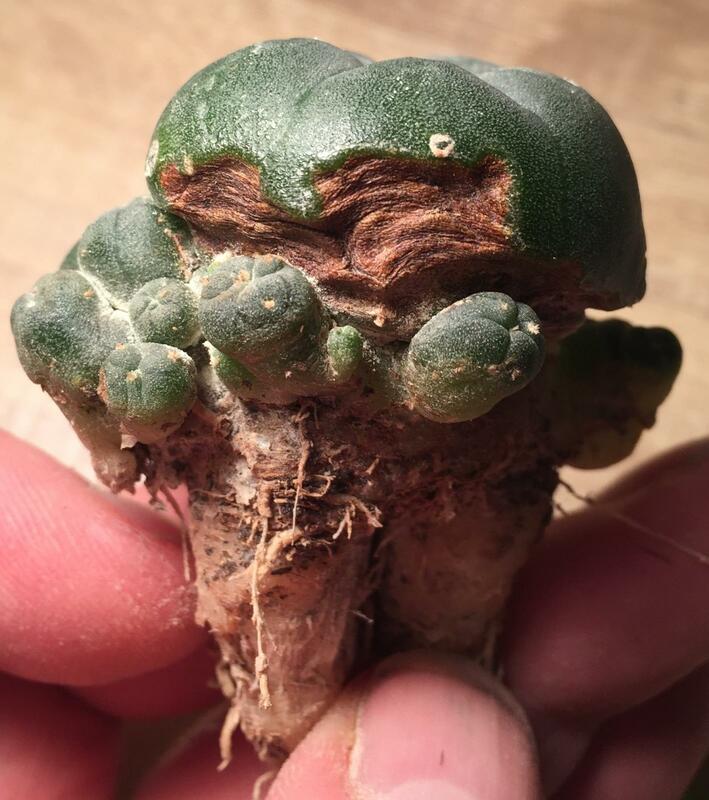 This appears to be a Caespitosa. I am hunting for info to match, but not finding any so far. I think you can assume this isn't going to halt its progression, and will eventually consume the whole cluster. I would personally remove any of the side pups that look clear and pot them separately after a thorough examination of all parts and roots. I would then be inclined to take one of the infected pups to cut along the edge of the infection to see if it spreads across, or is radiating out from the core. Also this would allow you to smell for any traces of rotten egg smell, on the orange band. If the core is still solid, clear flesh, you may be able to remove the hard scar, and more importantly the orange band on the edge while being sure to keep the blade sterile between slices. Immediately dust those fresh cuts with a rot preventer like rootone, sulphur powder, or cinnamon. At the very least you need to lift the whole cluster to evaluate to what extent this is spreading. 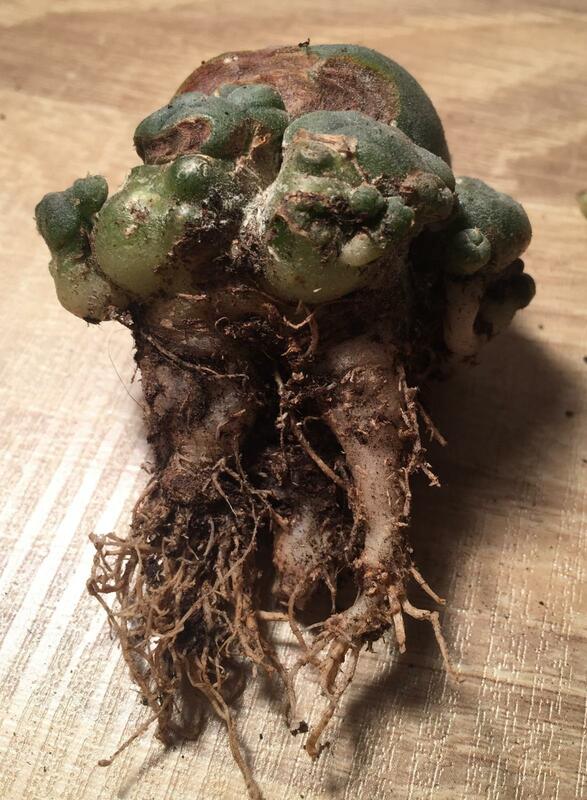 Are the roots affected at all? 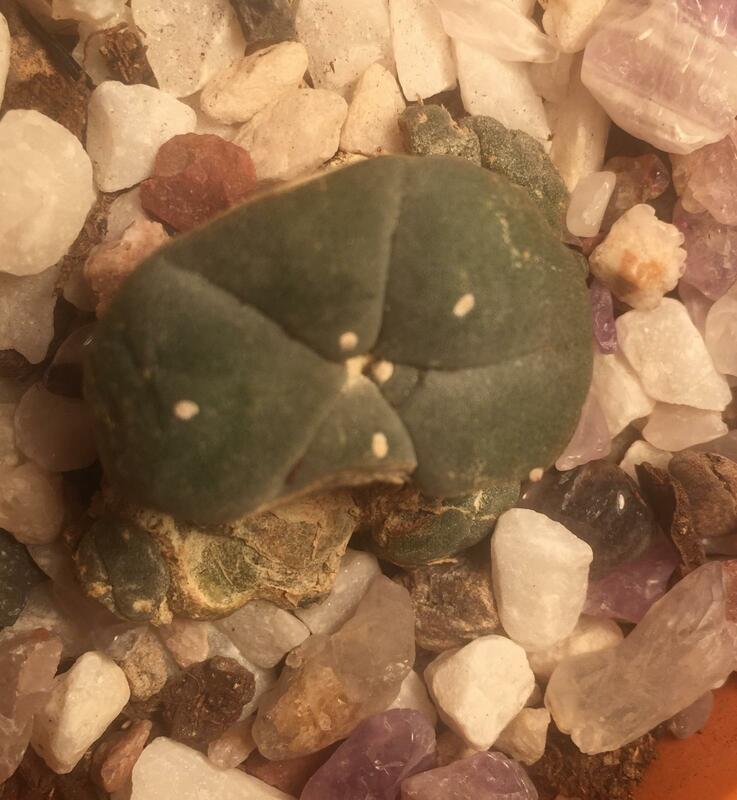 You are looking on the small pup you sacrifice, for information on how this is spreading, before you attempt any proceedure on the main cactus. You take excellent pictures bob, and if you could capture some of the interior of the small pup, it would verify what I suspect, which is that the orange band is the actual infection, which leaves a hard callus in its wake as it spreads. Hopefully it is not systemic. I will in the meantime keep searching for a match on the info and visuals you have provided. Edited by Skywatcher, 28 November 2018 - 07:18 PM. Hi. The plant has been lifted. Here are the roots. I have not, as yet, done anything else. The roots appear really healthy, and I cannot see any evidence of damage or rot in the tubers. This is good. 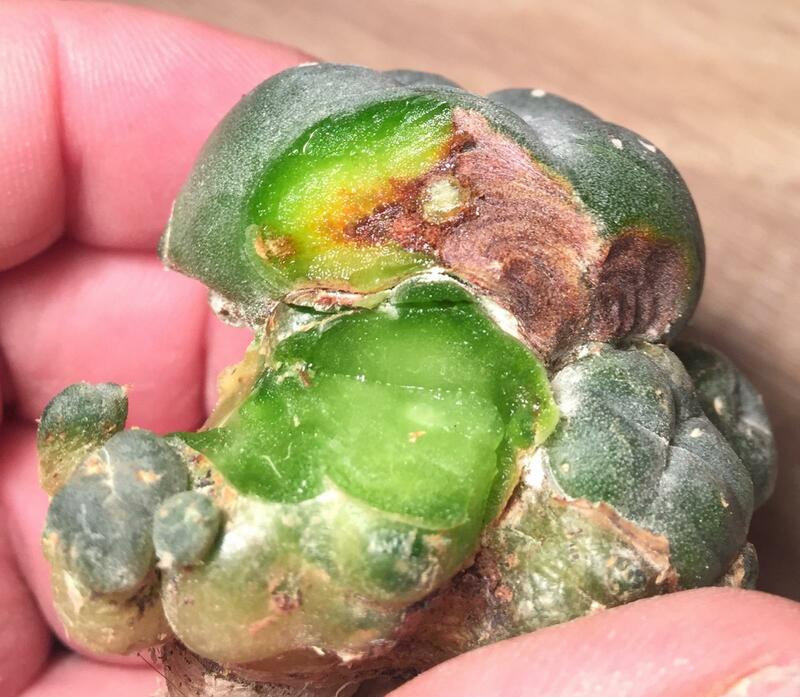 I have been searching my favorite cactus disease/ pest sites, and I cannot find a clear match for what you are seeing and showing. Things do not always fit into nice, neat, common descriptions. I believe you said this has taken about 8 weeks to progress to this point, so it isn't fast but I would have concerns about what is happening internally. Any form of rot I have dealt with has no treatment that is effective, other than removal to solid and clear flesh. Is this in a more humid environment? I can assume your soil mix is draining well by the root growth. 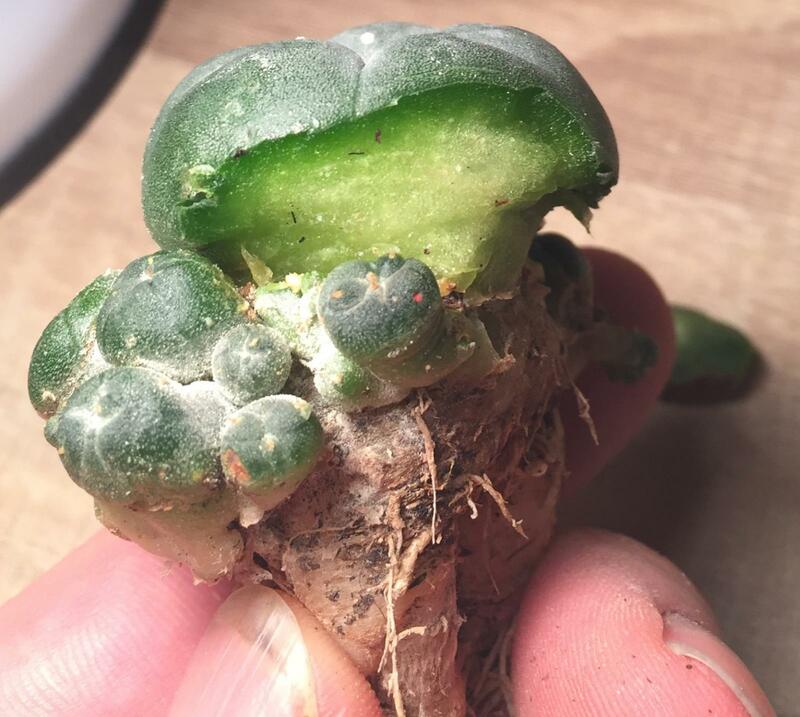 I'm going to advise you to find an obviously infected outer pup, that is showing the same hard corking, with some still good looking flesh. Ideally, large enough to be able to see the point where it goes from hard scar into clear solid flesh. Good flesh will be free of any spots or blemish, and apple like. 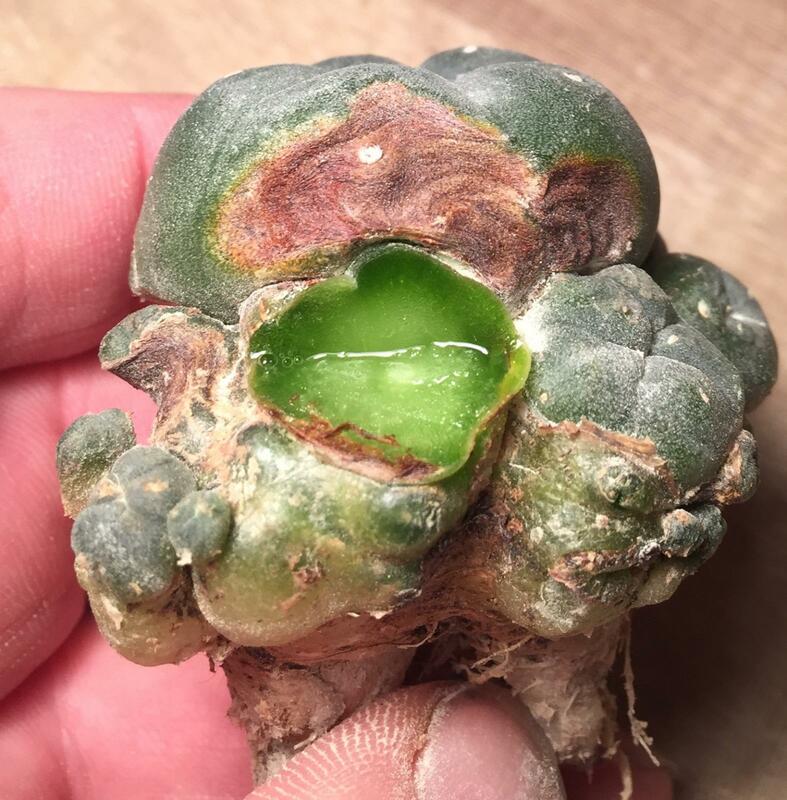 If the center core is clear and you have at least a third of the mass with some root that is clear, you can dry scar it and replant in dry cactus mix with a pretty good chance for it to regenerate and eventually cover the area with the scar. Because this is not spreading quickly like a wet rot, you have a bit of time to evaluate. However if the "test run" shows that this is spreading inward as well as across, you are going to want to remove it before it hits the central vascular system. Once that is gone, there is not much you can do. Keeping this cluster dry for a while may help to slow the spread until you know more. 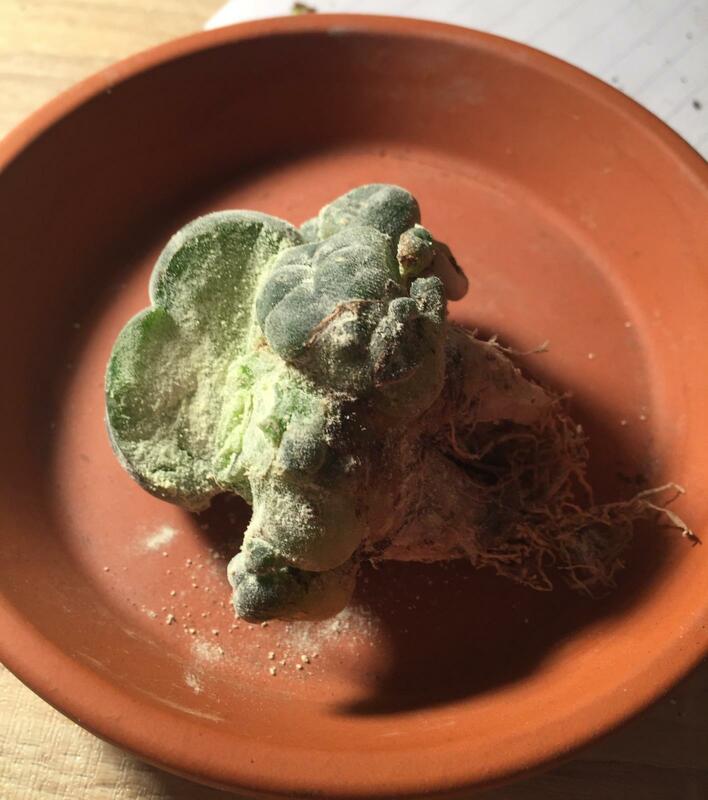 I'm sure you hate the idea of cutting into one of your sacred cactus, but I can tell you I have had cactus that lost about half after cleaning away all rotten material, which then recovered. 5 years later, you cannot tell it ever had a problem. Please let us know what you find. Remove very thin layers from hard area into the orange band. Smell for sulphery odor, and try to stop right past the area affected. Try to see if that band between is soft. Also look for evidence it has been travelling inward toward the core, which would look like orange, yellow, or dark spots. Unfortunately, this is the closest info I could find. Edited by Skywatcher, 29 November 2018 - 05:01 PM. Hi. I will ‘operate’ on a suitable pup and post a picture of what I find. 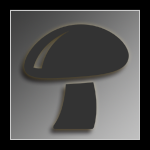 The link you sent suggests - perhaps - a fungal infection, not rot. If so, and assuming the infection has penetrated into the flesh, I could use your guidance on what part of the plant to salvage. 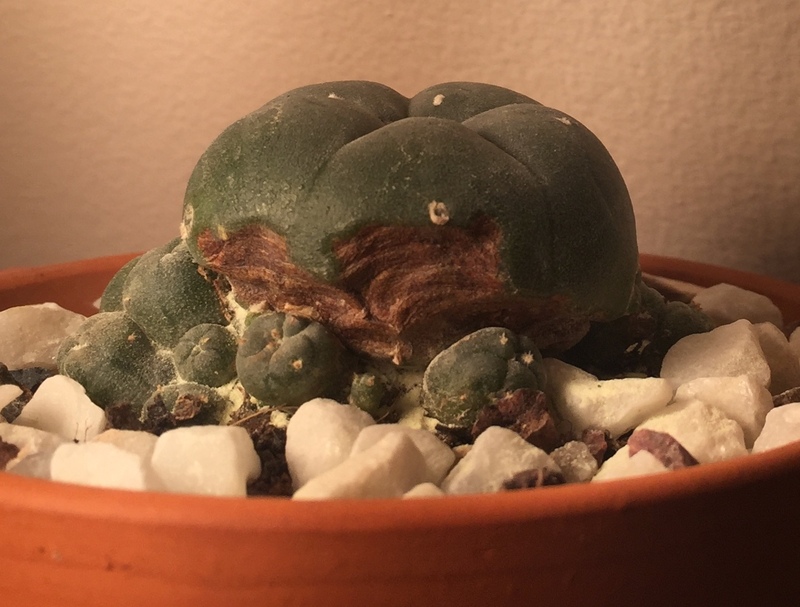 If the infection has not penetrated, do I attempt to cut out the thin orange perimeter on the mother bud? Presumably there is no point skinning off the calloused surface? I’ll get back. In the meantime I have dusted the plant with sulphur powder and left on my bookcase overnight. The room is dry, no humidity. Fungal infections are usually involving epiphytic cactus, but none of those in that section were a clear match. This one seems to fall into no clear area, so I would try to eradicate what causes the callus. I am making an educated guess that this is in that border area between, and hopefully not equivalently deep. I'm one that would always try to save a cactus, no matter the odds. Assuming you find a thin perimeter zone of softer discolored flesh, around and behind the hard woody scarring, you would want to remove it all. This is obviously going to leave what looks like a bite out of the globe. If dried well after and allowed to form a hard scar, it will quickly regenerate new side pups at each side, and possibly below. These will recover that area reasonably quickly. It appears you have a good amount of side pups at all ages and sizes. I would try to leave any that are still clear attached, as long as that does not mean you have to leave any unexamined areas. I use a very thin razor sharp blade. an exacto will work. Wipe the blade frequently with a diluted bleach solution. There are some very knowledgeable cactus people here, and all will try to help you but I will be happy to advise to the best of my ability. I'm crossing fingers this does not go deep. The pictures are fantasticly helpfull, and may help someone else down the line with a similar issue on their Loph's. 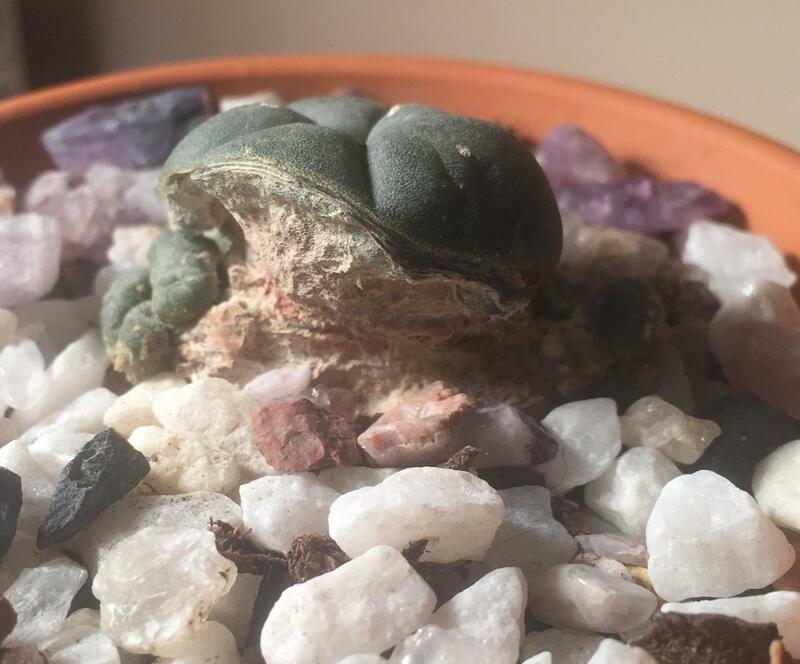 Correctly or not, my cactus has now gone under the knife. This is how it played out. It is now rested in a dusting of sulphur powder. 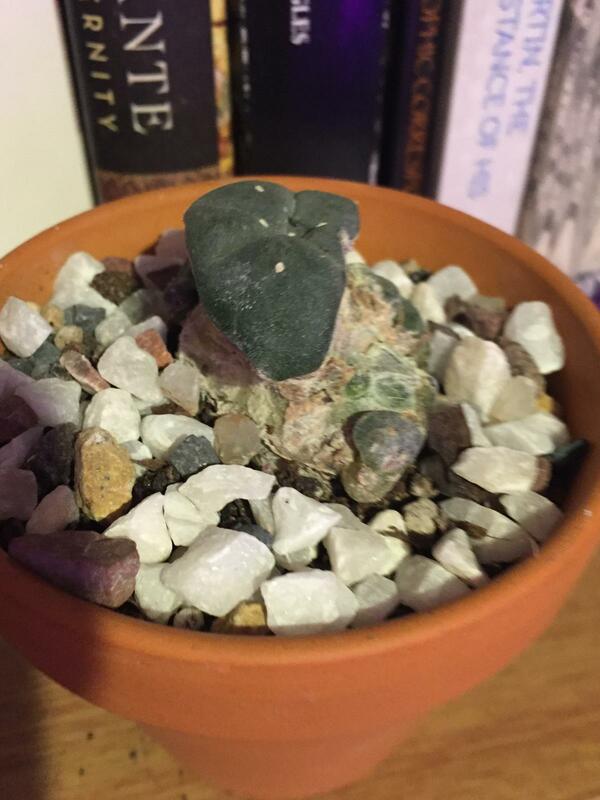 Assuming it has a chance of survival (? 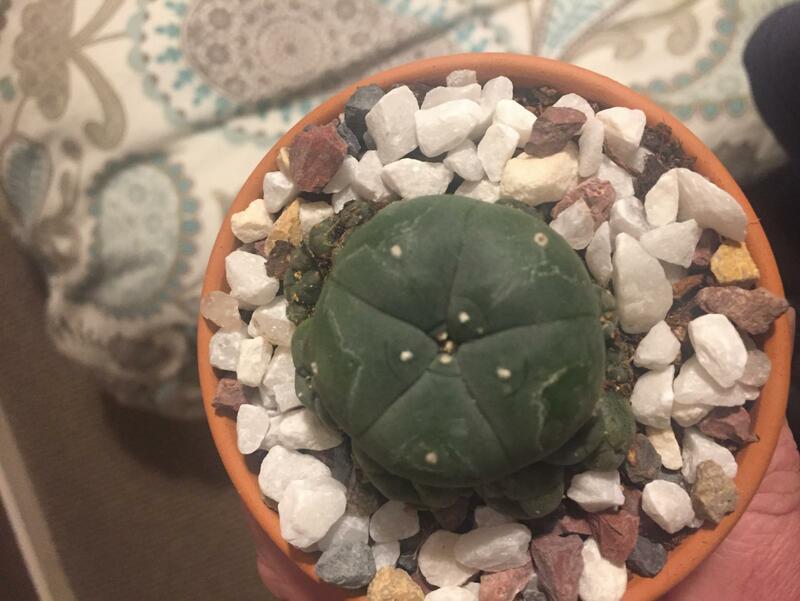 ), when should I re-pot it? I know that was painful to do bob, but it looks like you did well. 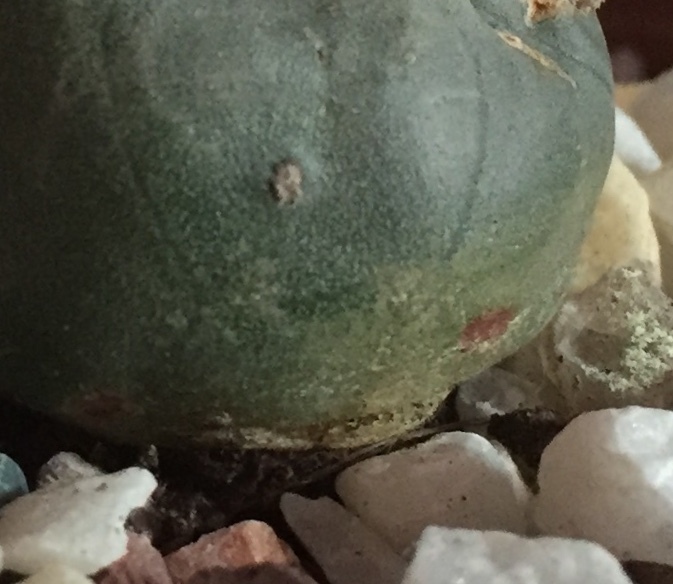 The interior pictures confirmed what a member here (peyote) referred to as the dreaded orange rot. I have seen it on one of my own quite a few years ago. 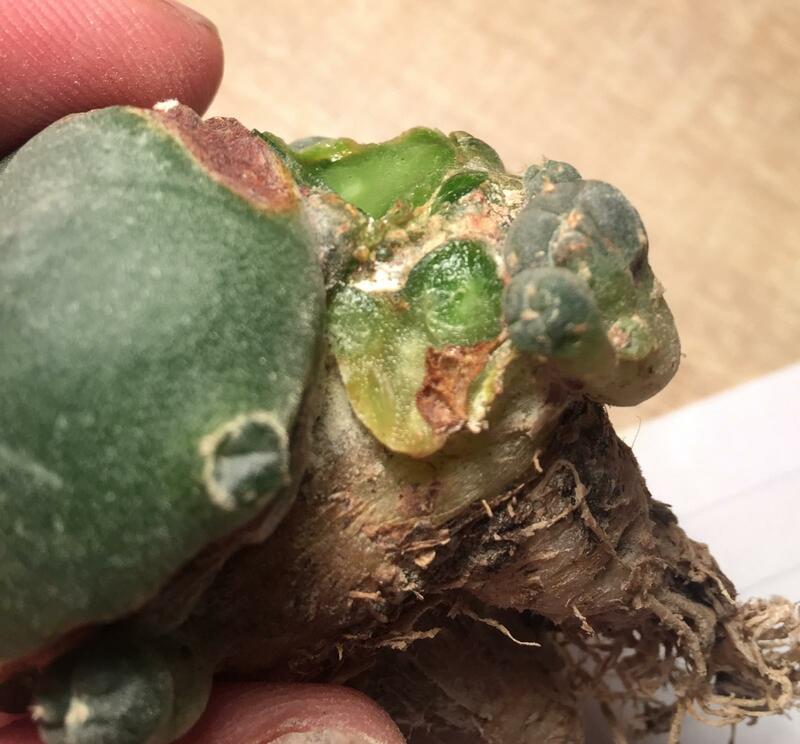 It spreads invisibly from an infection point, under the skin and can go into the systemic structure where it spreads like wildfire throughout, killing the whole cactus. I see clean bright apple green that you got down to in most areas, which is excellent because it means you have caught this before it went into the vascular structure. This most definitely will be able to recover. You can speed up the scaring process with moving air (like a small fan). When the cut area feels hard and no longer rubbery, you can plant in dry mix. Give it a few weeks after that before you water again lightly. I very much recommend you treat with the dry rooting hormone called Rootone, before you plant. It stimulates root growth, but also retards any rot or decay. There are some areas still of concern. Watch for a few days to see how it is scarring off, and if there is any indication that it is getting bigger, or staying wet you would want to touch up a little more. Orange is a color that should send a red flag up, so watch anything orangish or yellow, and be prepared to remove it. Good job my friend. 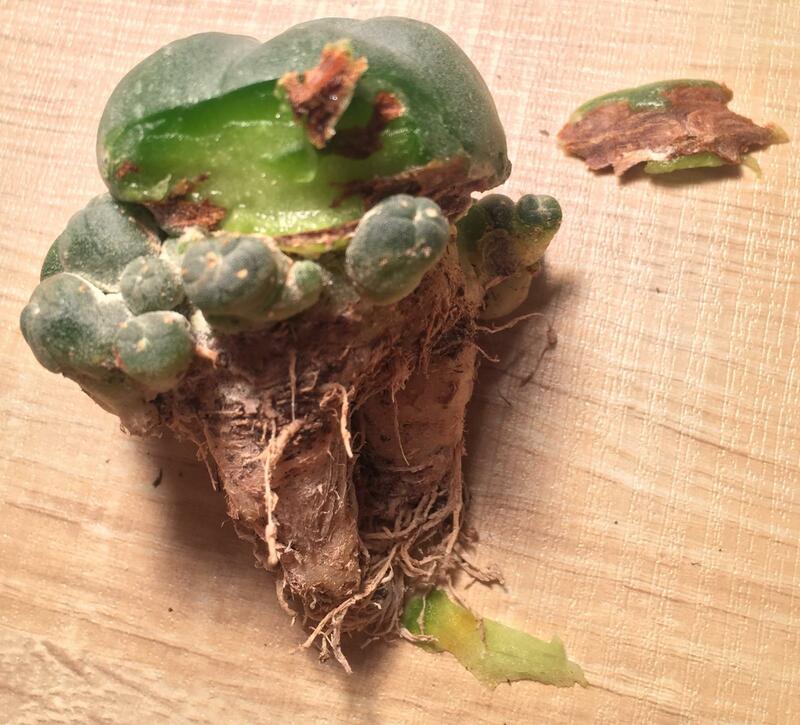 If this was your first cacti surgery, you did impressivly well. Once again, the photos are a superb help, for all of us to see what is happening. Thank you for taking the time to document this. Areas to watch are circled in blue. Edited by Skywatcher, 30 November 2018 - 07:14 PM. Many thanks for that. Might it be best to simply cut out the areas you have highlighted now, to be on the safe side? It was hard to ‘get at’ the callousing under the main bulb. 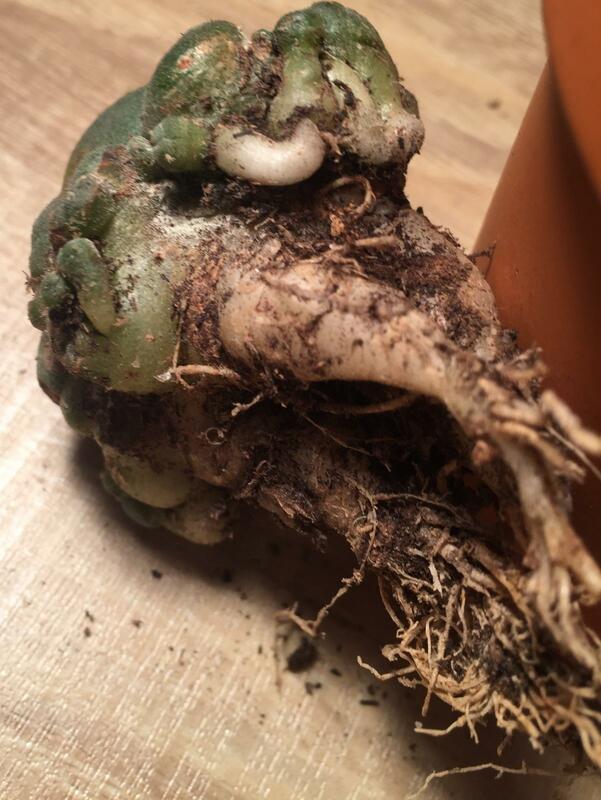 May I ask: how does the rot spread to other cacti? Might it have infected my other plants and are there any early warning signs to look out for? I personally am pretty accurate with a scalpel, so my tendency is to remove any suspect area as well, and then let it heal evenly. I think I would watch for at least 24 hours. After exposing the interior flesh to air, any orange to yellow infected coloration will darken up, and be easier to see. This was a different acting variant of this "orange rot" than I have seen, the way it seemed to leave a hard corky surface in its wake, and stay near the skin. I wish I had more definite answers for you as to how it spreads in the first place. My suspicion is an inscect bite or bird perhaps but I do not know this for sure. 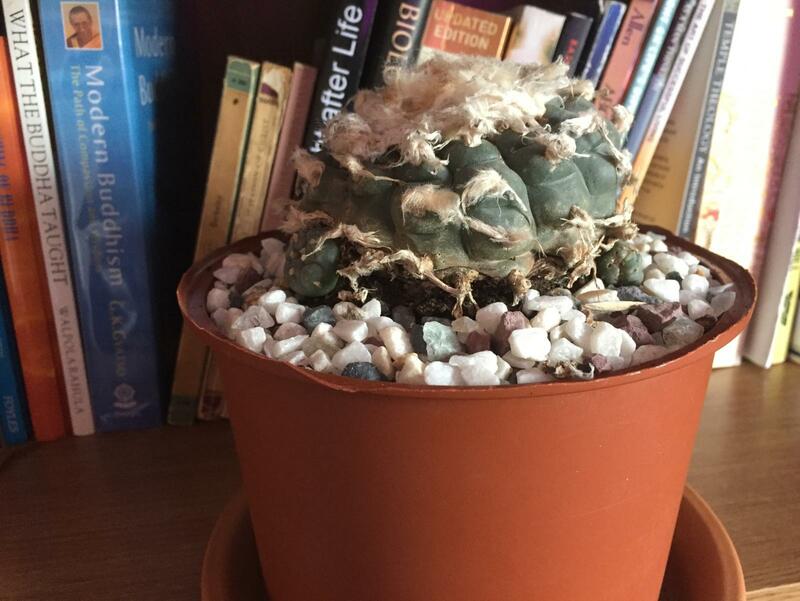 If your cactus are in individual pots, its not likely to spread. 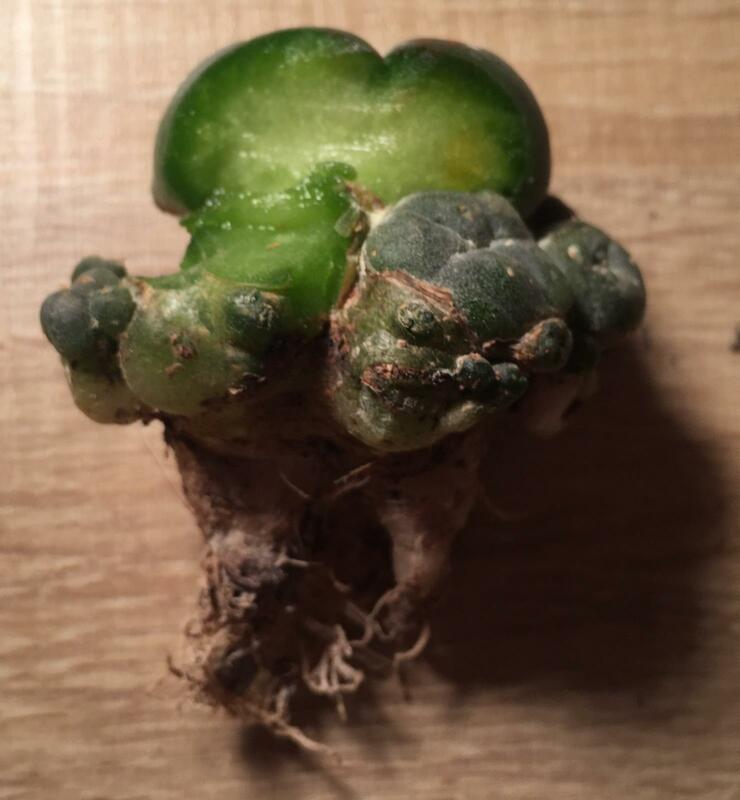 I have only seen this on actual cactus, not other kinds of plants. It seems to my recollection to start after some kind of damage, even very minor, followed by cooler and damper conditions for a while. The stuff I dealt with was the same exact color orange, but stayed mostly internal, with hard to spot little patches on the skin, only really showing well on the skin when it was pretty much too late. When I cut into the worst case, it was like orange splotches throughout. The other I saved by removing all the bad flesh and scaring off as I described. It had not reached the middle yet, and both these yotes were in the same pot. I've not seen it return for the last 5 years (approx). Thanks. 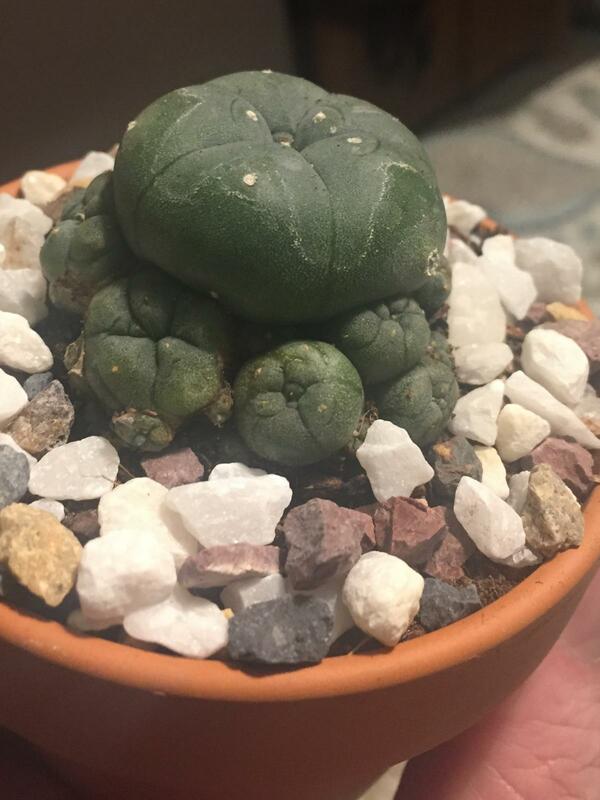 Here is a peyote I bought recently. I hadn't given it much thought, but are the marks on the pup not unsimilar to the rot discussed above? Do you have any thoughts on this? 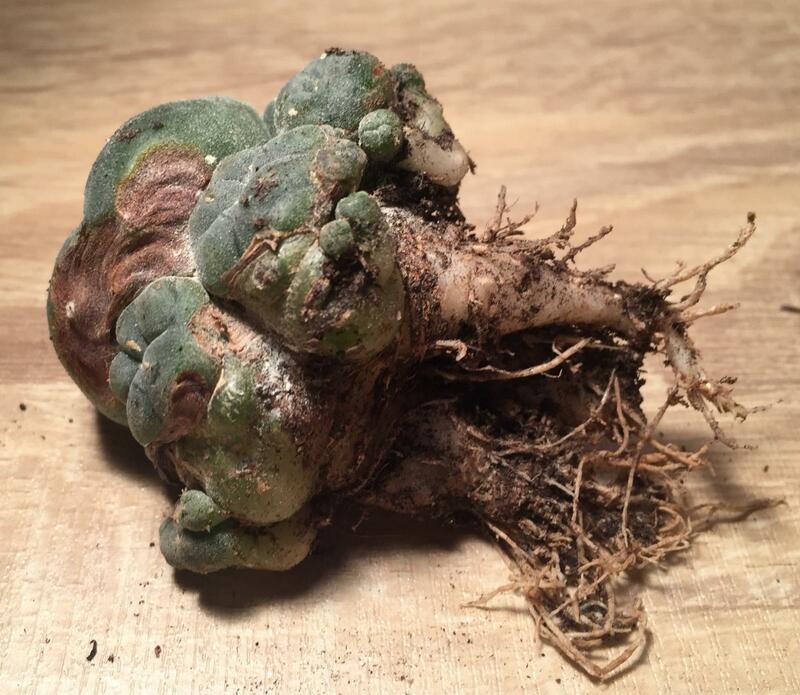 This cactus is a venerable old lady now, and produces a lot of seeds. Edited by Cactusbob, 02 December 2018 - 09:12 AM. Looks like normal bottom maturing to me. 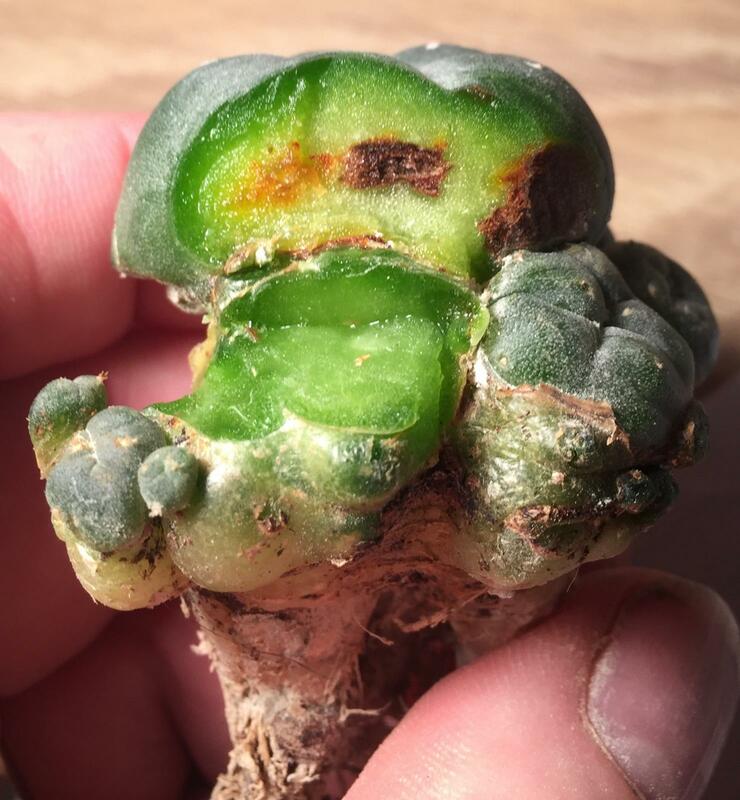 I always closely examine all my cactus at least monthly, but I am not quick on the draw to be concerned about a few irregularities. Most of the time, a healthy cactus will just sloff off any small issues, as the resilience and survival armament are strong. Unless I see something I recognise as a problem that moves fast, I tend to let the cactus grow as they will. A few flaws add to the character IMO. That is a beautiful "Old Lady". I love the massive tufts ! Hi. The peyotl looks quite different now! The cut areas hardened and I potted it in mixture that is totally dry. I will not water it for a couple of weeks. However, ref the second picture below, this is a photo of how it looked when I bought it 8 or 9 weeks ago. 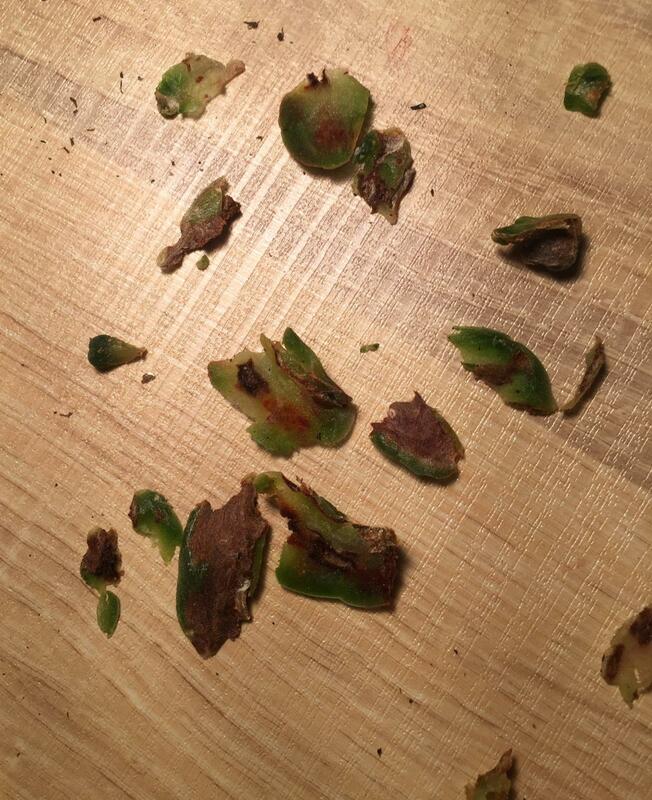 You may notice that there was a darker ring on the main bud. I didn't think anything of it at the time, but it was there before the 'orange rot' appeared. Might this have been an indication of the infection? I personally would not have seen the darker area as problematic. Certainly not enough so to be reactive. The healing on the cactus looks good and clean. Once the warmer growing season comes around, I would feed a bit more, something like earthworm castings or very low nitrogen ferts, preferably organic and dilute. I do belive since you were ably to save so much of the root tuber, you will see the heads doing double time to expand out again.